January 30, 2008—A kind, comfortably-sized woman in a bib apron and oven mitts sets a newly baked pie down on a cooling rack. Her grey hair is caught neatly in a generous bun, and she wears a pair of round, wire-rimmed glasses and a warm smile. It’s a scene that appears in countless children’s books, and there’s no need to read the text to find out the woman’s name. It’s “Grandma,” or some version of it, and when the page is turned, “Grandpa” is very likely to appear as a similar-aged gentleman with twinkling eyes, perhaps peering around his newspaper at the pint-size hero or heroine of the story. According to Candace Kemp, a professor at Georgia State University’s Gerontology Institute, grand cultures are “patterns of relating between grandparents and grandchildren within families across and within generations.” These patterns of interaction are often passed down, because each generation absorbs the example that came before and develops expectations of how they will behave (or how they will not behave) when it’s their turn to grandparent. Understandably, some families have positive grand cultures and others have negative ones. But as Kemp found in her 2007 study of grandparent-grandchild ties, social changes over the last century have dramatically changed relationships to the point that many families have no particular grand culture at all. In fact, this was true of fully half of the families she examined. At first this seems odd, with advancements in health, wealth and education having increased life spans so significantly. 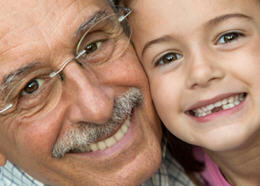 Theoretically, grandparents should have more time to cultivate good relationships with their grandchildren, not less. But several factors undermine these potential gains. Remarriage of either parent in the middle generation can also disrupt grandparent-grandchild ties, and with them the transmission of a consistent grand culture. In fact, other studies have demonstrated that a parent’s remarriage can have an even more dramatic effect on children than the preceding divorce. Favoritism is another noted barrier to the development of consistent grand cultures and is as destructive a force in the extended family as it is on the nuclear level. Preferential treatment of one grandchild over another, even if they are cousins rather than siblings, creates division and weakens the family structure. As a result, the likelihood of establishing an enduring grand culture is diminished as grandchildren determine to avoid the behavior they’ve observed in those who could have been their models. Broadly speaking, the common denominator in all of these undermining factors is distance. Whether of a physical nature, or of an emotional and mental one, distance in relationships can beget dissonance in relationships. The adage that absence makes the heart grow fonder doesn’t always apply in today’s socially fragmented world; affinity between people grows as understanding grows—and understanding requires communication. Unfortunately the modern family’s universe has experienced a “big bang”: people are more mobile than ever before and often find that economic and other concerns propel them outward from the family communities that were the original birthplace of society. But even as modern technology contributes to the distance problem, it also offers some amends. Today the Internet, e-mail and instant messaging have joined the telephone in the arsenal of tools used by grandparents to close the distance between themselves and their grandchildren, and the usage rate is steadily rising. According to a 2005 Kaiser Family Foundation survey, in the United States a third of people over the age of 65 have Internet access at home, and this percentage rises to 64 percent for the 50–64 age group. Obviously, as the population grows older there will be many more grandparents who are comfortable using e-mail and the Internet as a way to maintain contact with their far-flung grandchildren. But even though e-mail can be quick, easy and frequent, for most grandparents it still falls far short of face-to-face interaction. What can a grandparent do? Here’s one radical suggestion: if you can’t grandparent your own grandchildren, why not grandparent someone else’s? This may initially seem an unsatisfactory solution, even to those elders who are fortunate enough to have a few young people in their immediate sphere of influence. But a Brazilian study published in 2007 in the Journal of Intergenerational Relationships suggests that interaction with unrelated young people could bring grandparents closer to their own grandchildren. During the six months of the study, a group of previously unacquainted elders and teens were brought together for two hours each week to share life stories, participate in discussions, and take part in a range of activities related to reminiscence. At first the groups had preconceived negative images of each other. The seniors expected the teens to be rebellious, lazy, rude and disdainful of older people. The teens expected the elderly people to be critical, demanding, incompetent and uncaring. However, by the end of the study, the attitudes of both groups had gone through some amazing changes. For the teens overall, the exercise of crossing the intergenerational barrier and becoming acquainted with a few unfamiliar elders changed their outlook toward their own grandparents and made it easier for them to communicate within their own families. Though the teens and elders shared their life stories for only two hours a week during a few short months, both groups took their attitude changes home with them. If such short-term intergenerational connections between strangers can make a significant difference in the way people interact with their families, is it a stretch to believe that strong, positive intergenerational relationships within the family can radiate substantial benefits outward to the larger community? Unfortunately, communities themselves may be one of the worst roadblocks to positive grand cultures and good intergenerational relationships. At least, this is the suggestion proposed by sociologists as they study what they call “institutional age segregation,” by which they mean the socially constructed isolation of different groups according to their chronological age. Sociologists have observed that institutions divide the human life timeline roughly into thirds: childhood, or the education phase; midlife, which involves work and family-building activities; and retirement. Usually when any of these age groups is engaged in its primary activity, its members are physically isolated from people of other generations. There is little (if any) interaction across age barriers, except at the nuclear family level during relatively brief down times. Even during leisure time, institutions continue to encourage segregation by age. Communities have senior centers or youth centers. Church activities are also often structured within these narrow generational distinctions. But is there really any harm in this? Each of these factors is cause for concern, but two of them carry potentially serious long-term consequences: embeddedness and generativity. When individuals have strong relationship networks within society at large, they are considered to be embedded in the social fabric. They receive adequate social support and can offer support to others. But if networks exist only among age-peers, this support system eventually begins to break down. As people age, those who outlive their close friends are likely to suffer severe isolation as their support system disintegrates. Worse, when these support networks are connected only horizontally, society as a whole is weaker and people of all ages are more likely to feel isolated than if networks extend both horizontally and vertically. Generativity refers to building continuity from one generation to another through activities such as mentoring and teaching to ensure a positive legacy. Of course, this happens on an individual as well as a societal level. Parents hope to pass something of themselves on to their children, but they are also motivated to improve society in general so their children will have a better future. Unfortunately, researchers find that older people without vertical ties to younger generations are less likely to be concerned about contributing positively to society than those who have children or grandchildren. This state of affairs encourages the formation of diverging age cultures, and according to Hagestad and Uhlenberg, marketing entities are eager to exploit and fortify these differences. As a result, the more that members of each generation are convinced of their uniqueness, the less time they spend together, and the fewer opportunities they have to influence one another. It’s a cycle that would appear very difficult to break. However, some researchers are working on ways to do just that, using programs that appear to be somewhat more permanent versions of the Brazilian experiment described earlier. Sociologists call these programs intergenerational interventions—essentially organized activities that bring two or more generations together to become better acquainted through helping one another. For instance, older members of the community may enroll in programs to tutor teens or read to preschoolers. Some interventions may take the form of multigenerational music groups that perform in community venues. Still other programs bring the so-called bookend generations together in intergenerational daycare centers. A 2007 study published in the Journal of Applied Gerontology focused on just such a center, located in the northeastern United States. The center’s objective was to meet the care needs of preschool-age children and elders in a single facility while providing a variety of opportunities for the two groups to interact daily. To evaluate the success of such programs, researchers interviewed the elderly participants specifically to find out how they perceived the interaction had affected their emotional well-being. They found the elders to be overwhelmingly positive about the interaction they had with the children in the group; and most of the respondents, no matter how much or how little they involved themselves with the children, reported a sense of calm and familial connection from the program. Many pointed to the youth and enthusiasm of the children as key elements of the emotional well-being they felt from their involvement. One participant was especially uplifted emotionally by a letter he received from a parent of one of the children he had worked with in the center. The single mother indicated that his positive involvement with her child had inspired her to pursue an education and start a business. The man was gratified that his involvement had positively affected the lives of two generations at once. Successful projects like this one raise hopes that society could one day end the intergenerational cold war by tearing down the walls that have been erected between young and old in recent decades. But other studies hint that efforts will need to be determined and consistent if they are to be successful. Reporting on an intergenerational exercise program at a Massachusetts seniors community, Barbara M. Friedman and Francine Godfrey draw an interesting conclusion: “While being a role model was embraced by many of the older adults [in the study], a few were unable to see themselves in this position. In our nation’s relatively recent past, our elder population was encouraged by media and other sources to view the retirement years as a time for self-indulgence and total relaxation. With that came the unintended message that elders were an expendable part of a productive society. Now that the population is aging and demographics are changing, the need for older adults in the social fabric of society is crucial. . . . Yet, substituting one message for another is difficult and takes time” (Journal of Intergenerational Relationships, 2007). Undoubtedly it is time worth taking. But substituting one message for another may actually be the easiest hurdle. A more difficult task is likely to be that of substituting one course of action for another. This would seem to require a nearly complete overhaul of the social institutions that encourage us to congregate in peer groups and thus perpetuate a gap between two such important generations. Taken together, studies such as those mentioned here argue that strong grandparent and grandchild ties add important dimensions to family structure. Children need the unique perspectives—born of wisdom and experience—that grandparents can offer; and grandparents need the incentive to pass it on, which derives from having someone to pass it on to. Will every family’s positive grand culture include a storybook Grandma who offers her grandchildren freshly baked pies? Not necessarily. But there are far more important gifts that grandparents bring to the table. And most of them are considerably more sustaining. 1 Elza DeSouza, “Intergenerational Interaction Through Reminiscence Processes: A Theoretical Framework to Explain Attitude Changes,” Journal of Intergenerational Relationships (Vol. 5, No. 1, 2007). 2 Susan K. Fletcher, “Intergenerational Dialogue to Reduce Prejudice: A Conceptual Model,” Journal of Intergenerational Relationships (Vol. 5, No. 1, 2007).